I just got back from my 30-year reunion at the Lester B. Pearson College of the Pacific (also known as Pearson College or PC for short). I have been truly fortunate to have met so many great people while attending PC and to have experienced so many mind expanding moments. I took the photo of a rain downspout and the shadow it created on the wall of the Max Bell Hall while I was at PC. I called it Bonds of Friendship, Links of the Future in a whimsical hope that our time together would reflect into lasting relationships. I'm happy to report that it appears this has been true for many alumni. Like anyone attending a reunion, I wondered where the time went so quickly. Was it really 30 years ago that a gawky, geeky kid from "around the bay" Newfoundland showed up with his used Pentax Spotmatic at an incredibly gorgeous campus and embarked on an experience of a lifetime? Yep. I had already been passionate about photography for about 4 years before going to PC, so when I was immersed in the incredibly stimulating environment and given free reign to go take photographs, I was one very happy boy! I was also able to spend some time at the Vancouver Sun. The big leagues! The pros! Just what every teenage shooter back then dreamed of doing. That is me, below, at the Sun washing a print. The darkroom served so many photographers, most of whom were on a tight time-line, that the sink is outside the darkroom (see the light tight door on the right?) and finished prints are dropped through the ducting on the wall over the sink. We had access to all of the equipment and rode shotgun with the staffers. You would think this was "heaven", but I was shocked to discover a difference between photography as a passion and photography as a business. It was enough to frighten me into engineering as a career. When I made that choice in 1981, I resolved to continue taking photographs, but my purpose would be to document my journey through life: I would take "postcards" to share my major life moments and those of others. 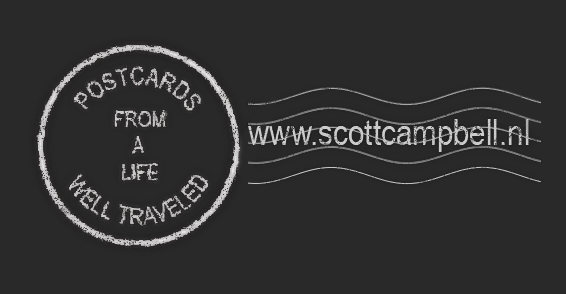 Hence the name of this blog: "Postcards of a Life Well Traveled"
For the reunion, I wanted to look back and share some of the "postcard" moments we had when we were students. I took over 2,000 photographs while at PC and I began scanning them when I "went digital" a few years as ago. To my dismay, most of the negatives I have are in terrible shape. Many have mold or mildew on them. Many are scratched beyond recognition. I spent 400 hours trying to save as many as I could, although in the end only about 250 were usable. My apologies to everyone who's photograph I no longer have. A link to the slide show directly in Flickr is here, which is useful for seeing the photos in a larger format. If you would like to see a particular photograph or to post a comment or two, go to the link here. If anyone has more photos to add, send them to me and I will upload them to the slide show. If you are on Flickr already, upload them to your account and add the tag "pearsonrefluxredux". It was very humbling to go back at look at my work with a more experienced, more critical eye. I could see I had made many, many mistakes back then and was a bit nervous about tossing my old work up on the screen for all to see. However, the point of a reunion slide show is not to critique, but to recall all of the wonderful shared experiences. Hopefully the slide show succeeded at that. Endnote: some of my classmates were looking for my 2010 Winter Olympics "postcards". A link to that post is here. Loved this. Thank you Scott. Mariana.